In 1845 twenty thousand people gathered in Lawrenceville, Illinois, to witness the hanging of Betsey Reed for poisoning her husband. Considered a witch by some, a victim by others; this is her story. In 1845, twenty thousand people gathered in Lawrenceville, Illinois, to witness the hanging of Elizabeth “Betsey” Reed. Convicted of murdering her husband by serving him a cup of arsenic-laced sassafras tea, she became the first and only woman ever to be hanged in the State of Illinois. Despised by the mob and considered a witch by many, she rode to the gallows sitting atop her coffin, singing hymns of praise. Was she a murderess or a victim of her own reputation? 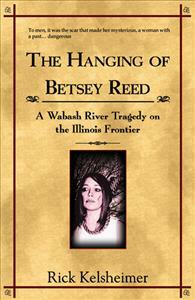 Based on actual events, The Hanging of Betsey Reed is a tale of treachery and deceit on the Illinois frontier. As a rule I don't like this type of story, but I must, say The Hanging of Betsey Reed is one of the best books I have ever read. The pace is fast and the dialogue is addictive. After twenty pages, I couldn't put the book down. The character's come alive and I found my self carried away to the 1840's. This book would make a great movie. I can't wait until Mr. Kelsheimer's next book. Two thumbs up!! !